I did it. I did everything on my to-do list and more. I really need a 3 day weekend but I will have to make my own because our next holiday is not until the end of March. Maybe I can work from home next Friday. Perhaps I could use "waiting for the plumber" as an excuse. I do need a new shower faucet combo in my bathroom and a new garbage disposal. But I am going to wait on the garbage disposal. I don't use it so I am not going to have a new one installed until I am ready to sell this house. In the meantime, it would be nice to have the old disposal removed and that side of the sink re-plumbed so I can use it without it leaking. Anyway, I cleaned every part of the house where the dogs are allowed to roam. That's everywhere except the 2 carpeted bedrooms. I washed all dog towels and blankets and dragged all dog beds outside and sprayed them with Lysol while they basked in the sun. All puppy stuff was washed and disinfected. All items too big to drag outside (couch and recliner) were disinfected also. All tile was swept and mopped. The yard was cleaned of dog poop and the mop water was dumped in the side yard where the mama dog was housed. The distemper virus doesn't live very long outside of a dog especially in a warm, dry climate but I took this as an opportunity to clean everything anyway. It feels good to have everything clean (for the moment). I started my taxes online with TaxAct. For a moment, I thought I might get a refund like I did last year and then I remembered that I had adjusted my withholding. Unfortunately, things went so well with my rental house this year that I owe $1,000. What a disappointment. I know financial people say that it is better to own money than to get a refund but, psychologically, I would rather have a refund. I need that incentive to get my taxes done. I shouldn't be complaining that things went well but I am. My mortgage is low so I didn't pay much mortgage interest. My medical and dental bills come out of my pre-tax health savings account so they aren't deductible. I get to deduct money spent on foster dogs but it still wasn't more than the standard deduction. Oh well. Maybe next year I should make an extra payment to the IRS so that my tax bill is closer to zero. I'd be ok with zero. I didn't submit my taxes yet. I like to put all the information in and then wait a week and re-check it. 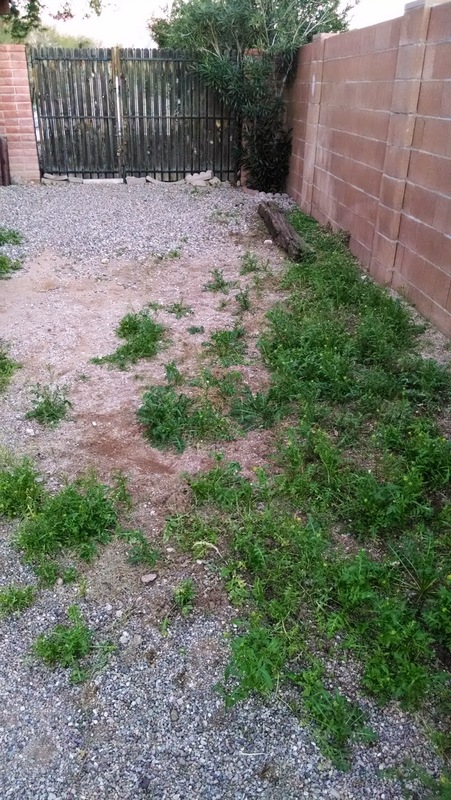 In between cleaning, taxes and watching movies with the dogs, I tackled the weed invasion in my yard. The weed of the month is London Rocket, a type of wild mustard. It is everywhere. I got about 70% of the yard cleared but this side yard still needs work. Next week it will be twice as tall. I tried feeding it to my quail but they weren't impressed. I need to work on the front yard too. I put the shovel next to the gate so that I can grab it when I come home from work and kill weeds a little bit each day. It isn't such a big job when I do it that way. This week I hope to hear from my handyman so that I can show him what I want done at my property and I should call the earth-mover guy to fix the drainage and driveway. It depends on how hectic work is this week. It would be nice to get something else done out there though. I'm feeling a bit stuck again. I need progress. Congrats, Daizy. I get worn out just reading about all the stuff you get done LOL! Don't get down on yourself for not getting even more stuff done. As for your taxes, make sure you are in a "safe harbor" to avoid any underwithholding penalties. One "safe harbor" is to owe less than $1,000 but that is not the only way. Making one or more quarterly estimated tax payments (I think you were alluding to that) is another (that's what I do because I haven't had any taxes withheld for the last 6 years). If your itemized deductions are near the standard deduction, you may be able to "bunch" your deductions to save in taxes (I just started doing that in 2014). It's a never-ending chore list, Dave. Why did I want a big house and yard again? And when I move out to my property I will have even more weeds to pull. I looked up bunching and it seemed to pertain to medical bills primarily. My medical and dental are all covered under my HSA so I can't deduct them. I suppose I could bunch my donations every other year. That might work. Daizy, you can also bunch things like property and state income taxes. Property taxes are often due at the end of the year but if you can pay one year's taxes in January and the following year's in December, you can double-up in a single year. With state income taxes, you may be able to make estimated state income taxes (which are due Jan 15) in early January or late December, enabling you to double-up in a calendar year. Maybe make a 13th mortgage payment in a calendar year so you will have some extra mortgage interest deduction. Put all of these things together (along with charitable deductions) and they add up. Hmm...good ideas, Dave. I usually pay my property tax in one payment in October but I could certainly pay half a year and then pay a year and a half the next time. That could work. Rocket is another name for Arugula. Eat it in a salad or soup. Practical Parsimony, first I would have to find some that the dogs haven't peed on. :) I hear it is peppery tasting. Not sure I would like it. I tried purslane and amaranth last summer which also grow as weeds. I was not impressed. You wore me out with everything you did! Hope you can enjoy a relaxing weekend. I too like to receive a refund. To me it's a way of saving some money for our car insurance. Although most people would tell you to put that money in a savings to get interest, but interest would be change, and I also know I would never get it in a savings.